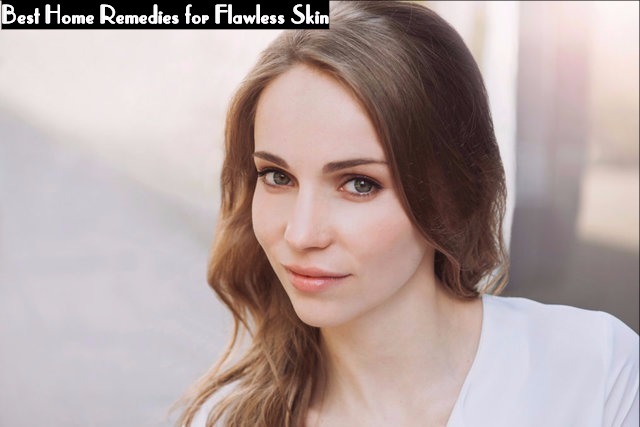 Having a perfect ad flawless skin is something that all women wish for. But only a few women are blessed with perfect skin that is smooth, glowing, even-toned and blemish free. You need spend a fortune to get flawless skin. There are home remedies and tips that can help you get the perfect skin that you have wished for. Aloe vera can reduce dark spots and scars and give your skin even tone. Take the leaf of aloe vera and cut it in the middle. Extract the gel from the leaf and apply it on your face. You can either plant an aloe vera at home or you can buy a bottle of organic aloe vera gel from the store. Egg whites have the ability to reduce open pores and to make your skin tighter. Take the white of an egg and whip it till it is foamy. Spread this evenly on your face. Leave it on your face for 10 to 15 minutes, till it gets dry. Then you can wash it off with water. Honey help in making your skin glow. With regular use it can make your skin flawless. All you have to do is to mix honey and cinnamon powder to get a thick paste. Apply this on your face and let it remain on your face for about 15 to 20 minutes. Now clean your face with lukewarm water. With regular use you can see your skin glow. Lemon juice is also good for providing you flawless skin. It has acidic properties, which acts as a natural bleach for the skin. Take a lemon and squeeze the juice from it. Apply the fresh juice on your face. Then rub the peels of the lemon on your face for at least 5 to 7 minutes. Wash your face with lukewarm water. Applying this regularly helps in lightening your skin as well as in making your skin look flawless, soft and supple. Take a small bowl and add tomato juice, curd and oatmeal into it. Mix them well to make a paste. Apply this paste on your face and wait for about 15 minutes. Now you can wash it off with cold water. Applying this pack on your face helps in making your skin brighter. It can also reduce scars, dark spots and blemishes on your skin. With regular use you can soon see the difference in your skin. Papaya is known for its immense benefits for the skin. Take the pulp of papaya and massage your face with it once a week. You can rub your face with it for 10 to 15 minutes and then wash it off with cold water. With regular use you are sure to get flawless and glowing skin. Apply raw milk on your face and massage in upward motion for a few minutes. Then let it dry. After it is dry, you can wash it off with cold water. Raw milk is effective for removing the tan and giving your skin a fresh glow. Many people do not know that potato is a natural home remedy for getting fair, glowing and flawless skin. All you need to do is to extract the juice of raw potato. Apply this on your face regularly. This helps in making your skin glow, reduce pigmentation and get rid of scars. After applying the juice on your face, wait till it dries out. Now wash your face with lukewarm water. It is also good for reducing sunburn and tan. Potato also acts as natural bleach for your skin. Sandalwood paste is very effective for our skin. Take a stick of sandalwood and rub it on a stone with the help of some rose water. Now apply this paste on your face and leave it till it dries. You will have to keep it for at least 10 minutes to15 minutes to let it dry. Wash your face with cold water. You can see the difference it makes to your face. It is better to use the sandalwood stick instead of the readymade sandalwood powders that you get in the market. This way you will get better results. You can use sandalwood powder only if you are very sure that it is pure and does not contain any other ingredients in it. If not, it may cause some damage to your skin. Sugar can be used as an excellent exfoliator for the skin. All you have to do is to take equal quantities of white sugar and brown sugar, and mix them well with some water. Rub this mixture on your face gently for about three to four minutes and then wash your face with lukewarm water. This helps in exfoliating your skin and remove dirt, grime and dead skin cells. It also helps in keeping your skin look youthful and glowing. Tomato has anti-aging properties which help in keeping away wrinkles, fine lines and age spots from appearing on your skin. It is also a good sunscreen, and is very useful during the summer months. Lycopene, an antioxidant present in tomato, is very beneficial for giving you clear and flawless skin. You can eat tomatoes fresh or you may apply a paste of tomato on your face to get flawless skin. It is excellent for getting rid of open pores, pimples as well as sunburns. Exfoliate your skin at least once every two days. Pamper your skin as much as you can. Use natural skin care products if possible. Use skin care products with care and give your skin a breather once in a while.